When you look in the mirror, what do you see? Do you see chips, cracks, discoloration, or alignment issues hurting the appearance of your smile? If you are dissatisfied with what you see, you are among the 33% of adults who do not like how their teeth look. Did you know that you do not have to live with the imperfections? You can get the smile of your dreams with your cosmetic dentist in the Lehigh Valley. Dr. S. John Salivonchik offers the services you need to improve your confidence with a radiant smile. Often, cosmetic dentistry is viewed as only being available for the elite or the vain, but this is not true. People from all walks of life are making the choice to improve their confidence by correcting the cosmetic flaws that are hurting the appearance of their smile. No matter if you have chipped, discolored, or misaligned teeth, you can transform how they look using customized procedures that cater to your needs. Porcelain Veneers: Thin shells are bonded to the front surfaces of the teeth to improve their color, size, shape, and proportion. They are very versatile, allowing them to be used to correct several issues, like discoloration, chips, and minor alignment concerns. CEREC Crowns: Severely damaged or abnormally shaped teeth can be restored using CEREC technology. You will receive a restoration that looks like a real tooth in just one day. Using advanced software, it will be made to match your exact size, shape, and color needs. Tooth-Colored Fillings: Now, you no longer need to have a dark filling cause an eyesore when you smile. Using a composite resin material, the filling is customized to match your enamel color to treat tooth decay. Teeth Whitening: If dark tooth discoloration has caused your smile to dull, you can get your teeth as much as 8 shades whiter at home. Using an at-home whitening kit, you will achieve professional quality results in about 2 weeks. Invisalign: You can improve your oral health and confidence with a straight smile. Instead of brackets and wires, Invisalign uses clear aligners to move your teeth. They are virtually undetectable for a discreet treatment while allowing you to get the results you want in about one year. If you are ready to love the smile that you see in the mirror, it is time to see if cosmetic dentistry is right for you. With a customized treatment plan, you will improve the appearance of your teeth while getting results that will last. Dr. S. John Salivonchik is a trusted dentist in the community who specializes in an array of dental aspects, including cosmetic dentistry. Due to his qualifications and reputation as a dentist, he has appeared on major news programs in the area. 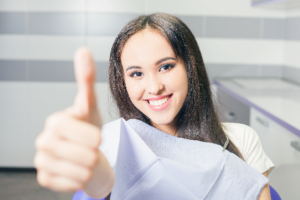 Supported by various dental organizations, like the American Dental Association, you can rest assured that you are in good hands. Start your journey to a beautiful smile. Contact our office today to schedule your consultation.